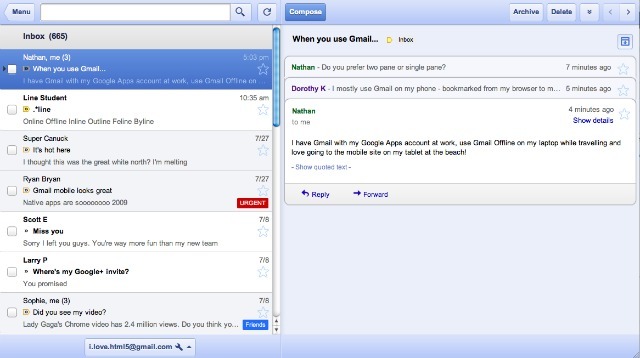 At the beginning of 2011, Google announced it has given up on Google Gears, its work-around gadget that allowed offline access for Google Mail services. Gears worked, but was a bit clunky so I can see why it was discontinued. Google wanted to shoot for a better solution based on HTML 5, and it looks like they’ve just about completed their task…with a catch. Google has released the Offline Google Mail app in the Chrome Marketplace this week. This app allows you to work with your Google mail when an Internet connection is not available. It also features limited Calendar and Docs capabilities, with more advanced features to be added in the next few weeks. The catch is you HAVE to use Google Chrome as your web browser — the app will not work in any other browser. I have been using Chrome for a couple of years now just because it’s so light weight and speedy (It also doesn’t choke when you have 15 tabs open at a time, which I frequently do). If you haven’t tried Chrome yet, it’s well worth it. The Offline Mail app supports most of Google Mail’s features and is based off of the popular tablet format of Gmail (as seen on iPads across the world). Calendar and Docs features are currently limited to viewing and RSVP schedules as well as viewing existing documents. As stated, more features are on the way, but I’m not sure how they’re going to handle offline documents — are documents going to be downloaded en masse, or are you going to be able to choose which documents are available locally? They’re probably still working that out, hence the current limited functionality. Word on the street is offline compatibility will be added to Internet Explorer, Firefox, and Safari down the road. In the meantime, if you really need offline email functionality Chrome is the browser for you. Update: It appears that some basic Google Apps accounts need to associate their email address with a Gmail account when you install the Offline Mail app. You can either sign into an existing account or create a new one. Not sure if this is a temporary work around or something permanent, but something you’ll have to look have to look out for. When on the move, you might want to give Offline Mail for iPhone and iPad a try. It stores all email offline, and then allows you to search it at lightning speed. I use it frequently when abroad, and its also great for finding email (which the Apple Mail App is really bad at). The Gmail App is good, but not for offline access. Next Next post: HP and Amazon Are Shaping Your Computing Future.